OTTAWA — Canada's continental partners are simply trying to work through difficult bilateral sticking points on NAFTA, federal insiders insist, even as the Canadian government appears to have been left out of ongoing talks between the United States and Mexico. 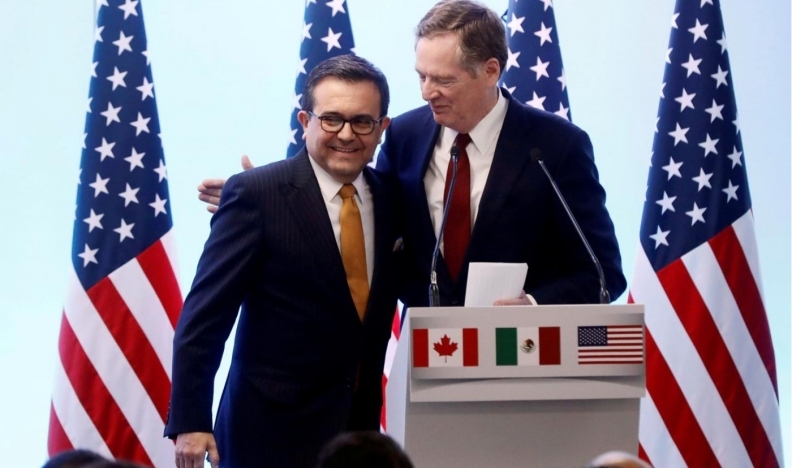 A senior government official said Tuesday that the U.S. and Mexico's return to the table to sort out their differences is a positive sign for the future of the North American Free Trade Agreement — even if Canada wasn't invited to take part. Top Canadian negotiators are expected to rejoin NAFTA talks by mid-August although no meetings have been scheduled yet, said the official, who spoke on condition of anonymity because they weren't authorized to discuss the matter in public. U.S. trade czar Robert Lighthizer and Mexican Economy Secretary Ildefonso Guajardo will meet again this week in Washington to discuss NAFTA, according to media reports. They also met face to face last week. Trade talks between the two countries have intensified since the recent election win by Mexico's president-elect Andres Manuel Lopez Obrador, who has assigned his own experts to work with officials from the outgoing administration on pursuing an updated NAFTA before he takes office Dec. 1. American optimism about a new NAFTA deal has also been heating up. In recent days, the Trump administration has signalled an agreement could be reached on the pact by the end of August. So far, however, Canadian negotiators have yet to participate in the summertime, high-level push towards an update to the three-country deal. The Canadian official rejected the idea Ottawa has been frozen out of the talks and argued it's not unusual for two of the NAFTA partners to hold discussions on bilateral issues without the third partner in the room. They said Canada is confident NAFTA will remain a trilateral deal, even though U.S. Donald Trump has threatened in the past to ditch it for one-on-one trade agreements. The official also noted that the U.S. and Mexico have issues to figure out between themselves, such as their differences on labour changes in the auto sector, textiles and seasonal fruits. Another senior Canadian source said Tuesday they're "not that fazed at all" by the U.S.-Mexican meetings on NAFTA. "I actually feel somewhat, cautiously encouraged by the fact that the Mexicans are able to be back at the table," the government source said, also on condition of anonymity. "I think the fact they're able to carve out some space to pick up on the conversation from where it was at, without knowing the outcomes, that at least in and of itself isn't a bad thing." A spokeswoman for Lighthizer also stressed Tuesday that there's nothing strange about one-on-one NAFTA talks. "In addition to the trilateral meetings, throughout the renegotiation of NAFTA there have been numerous bilateral meetings among the three partners, including meetings between Canada and Mexico, Canada and the United States, and Mexico and the United States," Emily Davis said in a statement. NAFTA's renegotiation has mostly been stalled since May, when the three sides were unable to strike a deal before the Mexican presidential election campaign. Lopez Obrador won the July 1 vote. One of the Canadian officials said Ottawa has seen a meaningful change in approach from the U.S. on NAFTA — externally and internally — over the last seven days. On Monday, U.S. Commerce Secretary Wilbur Ross said he thought there was a good chance American negotiators were on a "pretty rapid track" when it comes to NAFTA talks with Mexico, noting that Washington has fewer issues with Canada in the talks. "Mexico is, intellectually, the more complicated of the two; so if we can solve that, we should be able to fill in with Canada," Ross said during an appearance at the U.S. Chamber of Commerce's Indo-Pacific Business Forum. His comments followed other optimistic remarks from senior Trump officials, including Lighthizer. Last week, he told a U.S. Senate panel that an updated NAFTA deal to be concluded by the end of August. "That's not an unreasonable time frame if everybody wants to get it done," Lighthizer said. "My hope is that we will before very long have a conclusion with respect to Mexico and that as a result of that, Canada will come in and begin to compromise. I don't believe that they have compromised in the same way the United States or Mexico has." Ahead of last week's NAFTA talks between Lighthizer and Guajardo, Foreign Affairs Minister Chrystia Freeland, Finance Minister Bill Morneau and International Trade Minister Jim Carr met with Lopez Obrador in Mexico City. Following the meeting, Freeland said she was hopeful NAFTA negotiations could hit a higher gear.